We’ve seen plenty of leaked images of the OnePlus 6T at this point, but now we may have had our most legit look yet at the handset, as official marketing images have seemingly just leaked. 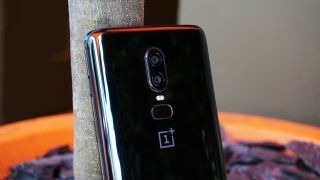 The shots were shared by reputable leaker Roland Quandt and WinFuture, and show the OnePlus 6T from most angles. There’s not really anything here that we haven’t seen before, but the images confirm details revealed in previous leaks, and do so in high quality. You can see the teardrop notch cut into a screen that’s apparently 6.41 inches, while around the back there’s a dual-lens camera. There had been some reports of a triple-lens snapper, but leaks now overwhelmingly point to just two lenses. The camera in fact looks more or less identical to the one on the OnePlus 6, though the flash has moved slightly, as you can see in one of the shots. The reason for that move seems to simply be that there’s no fingerprint scanner on the back, as this time it’s built into the screen. The new leak shows the OnePlus 6T in both Mirror Black and Midnight Black, with the latter apparently having a frosted surface. Since these images are leaks they should be taken with a pinch of salt, but given the good track record of the source, and the fact that we’re now probably very close to the launch of the OnePlus 6T we imagine they’re more or less accurate.